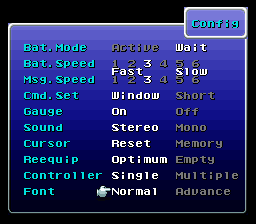 This patch implement a selectable GBA Font in Config menu. The only free space it use is less than $D0 bytes at end of bank $C3 for actual menu work. Otherwise, functions have been optimized or at least shortened in order to fit in the new code, especially in bank $C0. There are other code changes but they are smaller and always within the function they originally are from. See the asm files for all details. Some code still need comments but the uncommented stuff is long vanilla code with little changes. There are 2 hacks or implementations. The Original hack and the one made for expanded ROMs (EXP). In the Original hack, both fonts fits where the original font was, using the free space before and after in bank $C4. The free space used before the FWF to draw black menu backgrounds has been simulated by loading blank tiles in VRAM. This mean this version of the patch does not work with icon expansion s or other hack adding characters in the FWF before index 0x80. 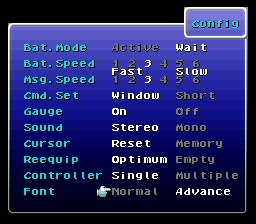 Since original font is moved, this patch break FF3usME dialogue viewing but not dialogue editing. You can always open a second editor instance to find caption, see changes, etc. with 00 to copy like in bank $C4 the empty space before the Normal FWF. With this version of the hack, you can see dialogues edits made in FF3usME and you can expand FWF characters before index 0x80. For other modifications I included the ASM files. You can assemble the code by typing the command xkas main.asm romname.smc or xkas main_EXP.asm romname.smc with xkas 0.06. If you use the header option in the ASM files you must enable it in all files. Thanks to seibaby for his GBA fonts! The only thing I'd change is "GBA" -> "Advance" in the font selector option. (12-08-2016, 02:09 PM)seibaby Wrote: The only thing I'd change is "GBA" -> "Advance" in the font selector option. Updated to version BETA 2a! I added a version of the hack (EXP files) where the Advance Font is in Expanded ROM ($F20000-$F224FF). This allow to not break the dialogue viewing in FF3usME. - Fixed a bug with Advance (GBA) item descriptions loading in EXP version. Thanks to Gi Nattak for report! - Fixed a bug where entering a flashback sequence with GBA font on would freeze the game. Thanks to James White for the report. - Fixed a bug with Font loading in VRAM for Colosseum matchup screen. You need to condense your code into a single .asm or use hard address calls. the JSLs to C0 dont apply in xkas cause it the C1 and C3 files don't see the label declared. Also, this breaks my battles in CoV =(... probably because I have the 5-digit damage patch already applied. I was hoping this wouldn't affect damage numerals... or if it doesnt, i'll have to figure out the other conflict. CoV would love this patch.